Giving to my new husband on our trip to Jamaica when we get married. Got this for the best man, he loved it! Could also be a good father gift! looked nice and the personalization came out great! I had it engraved "Best Man" "date"
Very nice cigar/flask combo, but be aware that a large gauge cigar won't fit. I thought I had bought a fairly normal gauge cigar and it was a very tight fit. The flask portion encrouches on the cigar side and this is not apparent from looking at it from the outside. Q:what size of cigar would fit into the tube? A:This item measures at 7.5" x 3.5" and holds one cigar. A standard cigar is 5.5"-7" long. 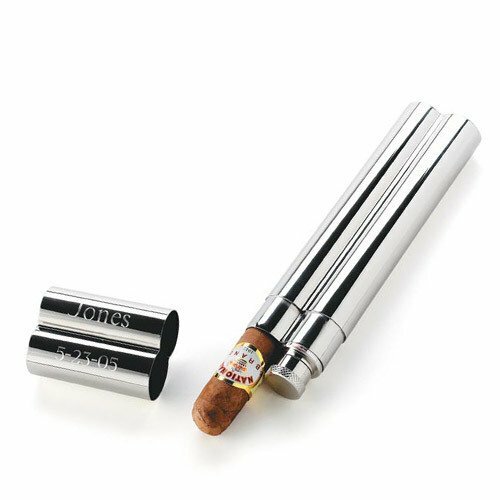 Trying to find a groomsman gift sleeker than this stainless steel cigar case and flask combo? Fuhgetaboudit. It doesn't get better than this impossibly cool combo. Ingeniously designed with a polished stainless steel finish, this cigar flask fits discreetly in a breast pocket. But with its slick dual functionality as a cigar holder and drink flask, your groomsmen and best man will do anything but keep theirs hidden! Measures 7.5" x 3.5" and holds one cigar and up to 1.5 ounces of his favorite beverage. Pair with a personalized cherry cigar humidor and give as an unforgettable gift.